Every now and again someone in Scottish politics pops up and mentions the word federalism. This has become even more frequent since the EU referendum. Apparently the fact that Scotland and Northern Ireland voted to Remain in the EU, while England and Wales voted to Leave has caused a problem that is so enormous that we need to have a new Act of Union, still more powers for Scotland and the other parts of the UK and we need to call this new arrangement federalism. Various models of federalism have been proposed. Some imagine that England ends up with its own parliament others that England is divided into various regions. It strikes me that if England can be split up into regions, then so too could Scotland, Wales and Northern Ireland. While Scotland has received a great deal of devolution from the UK in the past decades it has also seen a great deal of centralisation within Scotland. I would much prefer to be ruled by a local assembly based somewhere in Aberdeenshire. If it is correct to devolve power to Scotland, why not devolve it to the town level within Scotland? But it is entirely unclear to me how any of this addresses the issue of the EU. The threat to the UK comes from the SNP. As Scotland voted differently to the UK as a whole, the SNP think this justifies them threatening to leave. Would federalism alleviate this threat? Ever since we began the process of devolution in Scotland we have been promised that giving more power to Scotland will eliminate Scottish nationalism. In fact quite the opposite has occurred. Scottish independence has gained in popularity the more power has been devolved to Scotland. A generation ago we had a constitutional convention that Labour and the Lib Dems promised would solve the problem. It didn’t solve the problem, but rather created it and then made it worse. Next Gordon Brown in response to higher than expected support for Scottish independence vowed to give the Scottish parliament still more powers. He no doubt expected that this too would see off Scottish nationalism. Now Kezia Dugdale promises a new constitutional convention giving Scotland still more powers. This too she, no doubt, hopes will diminish SNP support in Scotland and transfer it to her. It really is time for a period of reflection by Labour. They have frankly done enough damage as it is. They were the first to play the nationalist card when the continually complained about England voting for Thatcher while Scotland voted for Labour. It was this and this alone that gave rise to the modern SNP and the loss of nearly every Labour MP in Scotland. It would be well if Dugdale, Brown and Co. first apologised for the damage that they have done before attempting to do more. There is nothing intrinsically wrong with the idea of federalism. It works well in a number of countries. But it doesn’t really address the issue. Scotland already has a similar amount of power to a state in the United States. Would giving Scotland still more power satisfy Nicola Sturgeon? Scottish nationalists greedily gobble up ever little concession of power from Mr Brown etc., but do they ever make a concession in return? They would react in exactly the same way to federalism as they reacted to devolution and “the Vow”. They would take it, bank it, complain that they hadn’t in fact been given anything and then ask for more. Devolution and indeed federalism depends on the idea that some issues are devolved while others are decided centrally. Some people seem to forget that while each state in the United States has a great deal of state power and local devolution within each state down to the town level, there is also a strong central government. There are things that each state decides for itself and things that are decided in Washington. Even if the UK were a federal state, there would be times when Scotland would be outvoted. This is not a problem with devolution. It is a feature of devolution. Perhaps Miss Dugdale thinks federalism would give Scotland a veto over leaving the EU or the arrangement that results from leaving. But then should London have a veto, or Yorkshire? Why should one grouping of five million people be more equal than others? Perhaps Miss Dugdale or Miss Sturgeon think that a Labour or SNP majority in Scotland should be able to rule over the whole of the UK. But all this shows is that they both have tendencies in the direction of Scottish nationalism. It is crucial to realise that talk of federalism is to miss the point for even if the UK were a federal state matters to do with foreign relations would still be controlled by Central Government. So how would this arrangement help the present situation? Federalism just makes one more concession to the SNP without changing the fundamentals in any way whatsoever. Scotland and Northern Ireland would still have been outvoted even in a federal UK, because international issues would not and could be devolved. It is Washington that makes trade deals, peace treaties or war. Bismarck North Dakota may find itself outvoted. It is vital that Scottish politicians cease helping the SNP. They all, including Ruth Davidson, think that it is a problem that Scotland voted one way while the UK voted differently. It is not a problem it is a feature of us all living in a single sovereign nation state called the UK. Devolution and federalism can give the parts of such a country a degree of power, but they cannot make a part always vote the same way as the whole. In no country in the world is there such an arrangement. On certain issues parts are always going to be outvoted. There is no level of federalism that will satisfy California if it is determined to leave the USA because it doesn’t like President Trump. Federalism does not guarantee that there is not going to be secession. The USSR was a federal state. So was Czechoslovakia. The United States itself was threatened by secession. Its federalism did not save it. It was instead saved by the United States Army. The crucial point is that even if the UK were federal the parts would be subordinate to the whole. No amount of devolution will change this. But it is this that Scottish nationalists will not accept. But to grant them what they wish is to grant them independence. There is only one lesson to learn in Scottish politics, but no-one seems to be able to grasp it. You can do nothing to satisfy a Scottish nationalist, so don’t try. Give them nothing. Devolution or federalism only works when it does not give rise to nationalism. If the parts of the federation continually think of themselves as independent then they will continually be insubordinate. This is what is happening in Britain at the moment. We do not need to have a constitutional convention. All we need is the acceptance by everyone that devolution involves the fact that certain decisions are taken centrally. It is this after all that we voted for when we voted for a Scottish parliament. When this is not accepted then logically devolution subverts. When this happens it would make more sense to take away the source of the subversion rather than allow it still more power to continue to undermine the unity of the United Kingdom. There is no need for yet another constitution convention. The issues are already clear. But it might indeed be well to have a new Act of Parliament, call it a new Act of Union if you will. The Act should state that the United Kingdom is permanent, that its parts are subordinate to the whole and that the UK Government will not tolerate attempts to undermine our nation state from within. No power either foreign or domestic may be allowed to do this. The Act should furthermore state that the United Kingdom’s experiment with referendums has now ceased and that all future decisions will be made by Parliament. It doesn’t require federalism to pass such an Act. It only requires a majority of MPs. The Core of the SNP come from Republican IRA & embittered Scottish voters who still have history ingrained into their soul. We all have our own views on how the Scotland should be run but rarely do we attempt to willingly destroy a Union that has delivered prosperity to this country over the years. Pretty much agree with your conclusion, Effie, though I'm not sure I would entirely rule out referenda - after all, it could be a bulwark against nutty politicians, of which we have plenty. But what I would most certainly include would be a two-thirds majority, either in Parliament or in referenda, or both, required for constitutional change, which is the sort of barrier required in many other countries, including the US. On the broader subject of appeasement of the Nationalists, it's instructive that the one person who had the balls to be implacably opposed to Scots Nationalism and to offer them, basically, nothing - Margaret Thatcher - reduced the SNP vote by hundreds of thousands (by 1987 it was half what it had been in October 1974); and as soon as appeasement started under John Major, the SNP strength exploded. I think the moral of the story is: don't try to compromise or be conciliatory towards single-issue fanatics, because they will accept nothing short of their ultimate goal; while any appeasement will only strengthen them, and weaken you. Margaret Thatcher also opined that if the SNP gained more than 50% of Scots MPs at Westminster they'd be entitled to independence. The SNP vote reduced in the 1980's because Scots (not unreasonably in the circumstances at the time) thought voting Labour would help keep the Tories out of power. The repeated failure of this tactic, and the inability or unwillingness of Labour to deliver "true" devolution, adequately explains Labour's subsequent decline and the growth of the SNP. It's the failure of the unionist elites and parties to satisfy the entirely rational and reasonable desire by Scots to have more powers to govern themselves which has led to the current popularity of the SNP and the rise in support for independence. I absolutley agree with you ndsl61, all the unionist parties are to blame for this state of affairs for failing to recognise that there is a need for a greater decentralisation of power not just in Scotland but in England too. Currently we have horrendous levels on inequality in this country and a key reason for this been that people do not have enough control over their lives. The SNP have been able to expolit this because they are a Scottish party that talk about Scottish issues. With all due respect Effie I think federalism is actually a good idea provided it is implemented sensibly, ie, with the pro unionist parties in Scotland becoming fully autonomous and with power devolved to Scottish regions. If the same happens in England then that is the basis for a sensible settlement. The major mistake made by the devolution settlement of 1999 was that none of the main political parties devolved greater autonomy to their Scottish branches. Had they done so it is feasable the 2014 indy referendum would never have happened. Is it just sheer coincidence that the Conservative party was a highly significant force in Scottish politics before 1965 when it was fully autonomous, and then shrinked to a point where it had no seats in 1997? And then that its fortunes revived again after David Cameron granted it greater autonomy in 2010 its fortunes significantly revived? I think not. Mainly agree Effie though not sure on your claim that Ruth has been weak on this. Federalism is the wrong answer to the wrong question. It smacks of Scottish Labour floundering to find a USP; a new identity in which to appeal to it's lost voters. And federalism isn't it. It means nothing to the unemployed or low income / working class. Federalism isn't even a topic in middle income dinner parties. No-one cares for the differences between devolution of powers and federalism. To steal a Churchillism; "An appeaser is someone who feeds a crocodile hoping that it will eat him last" and that is where Scottish Labour is at the moment. Trying to appease an electorate who left (in a vain hope of return) when it became bloated, conceited and flakey over it's principles. I generally think Scottish politics today is about nationalist separatism -v- unionism. How can you explain those who abandon their so called socialist / Left wing principles to vote for an SNP who demonstrate non progressive policies? Demonstrated by council tax, income tax, APD and free tuition? How can you explain the loss of cynicism towards politicians who have vandalized our children's education, wrecked our health service and demolished our police force all in the name of nationalist centralization and control? The only thing the last years have done to me in Scotland is harden my position against Nationalism and against the transfer of any more powers. But there is good news I think: Sturgeon is floundering too. She has boxed herself in on Europe. She can't and won't call a referendum. She doesn't have the authority, a mandate nor the economic head winds. More importantly Sturgeon doesn't have the guts until at least 2021 where it will be Briagadoon or Bust. And by then her minority government will have weakened even further and unable to call. 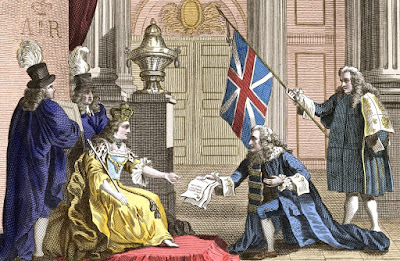 The reason federalism won't work in a UK context is chiefly the disparity in size between the units envisaged, and the lack of any appetite for it in the English regions. Whatever convinced britnats like Effie think, there IS a difference between Scotland and the regions of England, historically, culturally, socially, educationally, legally and politically. Federalism in a Scottish context has died on its arse because unionists have no intention of delivering the level of devolution which might have satisfied the majority of Scots until relatively recently. The failure to deliver "the Vow", still less true home rule (or full fiscal autonomy or whatever you chose to call it) has I would agree led to a daily stark nationalist vs. unionist split. Brexit has only made this more complicated. Unsurprisingly, I disagree with you take on Sturgeon's position. It seems to me (and I would venture the majority of Scots whether SNP supporters or not) that she has May just where she wants her. She won't call a referendum until she's confident she can win; that's simply common sense. all she has to do at present is give the shambolic brexiteers enough rope to hang themselves, which they are doing in spades. I know you probably disagree, but she has a clear mandate to hold #indyref2. The Tories have neither the cojones nor the support to prevent it. The SNP & green party have a majority at Holyrood, so if they call a referendum, it is going to happen. The economic case now is less important than the economic case 2-3 years from now; as brexishambles develops, it's by no means clear Scots voters will see staying in the UK post hard brexit as an attractive option. 2019 is a more likely date IMO, but the future isn't ours to see. Predictions of the SNPs demise and a collapse in their support are laughable. It always amuses me when unionists predict the SNPs decline, or that high water has been reached. How's that been working for you? Shouldn't we be seeing some evidence of the decline by now? Why is that do you think? Earnestly wishing for something isn't the same as reality, but given your analysis of the political situation, I'm not sure reality is your thing, huh? You had me until "Britnat" and "The failure to deliver "the Vow". Which you know was over delivered and even Sturgeon baulked at FFA as she knew we'd be broke and unable to pay for her Nationalists Utopia. Where I do agree is she can increase the value of her own stock by making mischief about "Brexit shambles". But that is what those who don't have responsibility or power do: mock, blame and say how better they can do it while never having the responsibility. I also agree that she won't call it " until she's confident she can win" which will frankly not be in the next 4 years. Unless of course she knows she will be defeated in 2021 hence my 'Brigadoon or Bust'. There is a SNP mandate (I realised she said it in vacuous language in 2016 without a date) but that isn't the same as having support from Scotland or the same as having the competence to call it [which she does not have]. Hey, I'll even agree that we can't determine the future but ultimately all political careers wane, fall. But Sturgeon, unlike Salmond, isn't as stupid or brash. Indeed she is like your drunk mate kicking off in a pub behind Scotland's shoulder saying "Am gonna huv ye - hawd me back". We are entrenched. Between Nationalists that hate England more than they love Scotland and those that see economic benefits in being in a Union that spreads risk and provides fiscal transfers when required. Isn't it cultish that the cognitive dissonance Nats have in deceiving themselves with in thinking one Union (that only takes from the UK) is somehow better than one that only gives to Scotland in recent years? I know we won't agree but to leave it like this: You're a Nationalist. I'm a Rationalist. In what way was the Vow delivered ? How can you actually type that with a straight face. Its utter tripe and deep down you know it. The problem you have is you did't even want the Vow in whatever tiny way it changed a few items. So you'll happily settle for anything and expect everyone to do the same. The Vow was a lie and any possible it saving of the Union was killed by Labour opposing almost everything. What is so draconian about just saying , you know what, you guys keep all the money you get. But you are on your own. The vow bestowed far reaching tax and welfare powers - powers the SNP haven't used. You and other "britnats" really need to get over yourselves taking exception to a perfectly neutral contraction of British nationalist. It's no more negative than calling a Scottish nationalist a Scott, or a cyber nationalist a cybernat. You may not consider yourself a British nationalist, but the fact that you may bridle at the epithet doesn't give you the right to tone police the internet and demand others don't use it. try concentrating on the actual argument, not lame hurt feelings about innocuous nick names. The Vow wasn't and hasn't been delivered. Gordon Brown's "near federalism" is very far from on the table. If unionists HAD been honest and made even a modicum of progress towards full Home Rule, perhaps they wouldn't be in the sorry state they are now in Scotland? As a thought experiment, why not start from the the position of assuming that all revenue raised in Scotland stays in Scotland, and the Scottish parliament has absolute discretion over everything short of defence and foreign policy, for which they would contribute to the "union" parliament in Westminster? No more Barnett formula, no more arguments about who subsidises who. All taxes and revenues from Scotland got to the Scottish parliament which pays an annual subvention for "shared" services. No more Scots MPs at Westminster, just a reformed "union" parliament or senate to decide on defence and foreign policy. Plenty of people outside Scotland have been mightily impressed by the SGs approach to brexit. At least they have a plan, unlike the Tories. NS already has the support of, and mandate from, Scotland to hold indyref2; it was specifically called for and given in the last Holyrood elections. However hard britnats find it to accept, there is no unionist majority at Holyrood; Patrick Harvie has specifically said the Scottish Greens would support the calling of indyref2. As for the "competence" to call it, there is no legal or constitutional consensus that Westminster has any veto. Neither Scotland Act prohibits the holding of referendums, ergo they are permitted (see the article by lawyers Halliday Campbell if you want to argue the toss...!). The whole reason Cameron proceeded with the Edinburgh Agreement was to prevent the matter going to law, because he wasn't sure he would win. Refusing to grant a Section 30 order would simply lead to a constitutional crisis from which the unionists would without doubt come off worst. You and others who think like you need to get over this obsession that supporters of Scottish independence "hate" England or the English. We may hate aspects of the britnat/unionist system and establishment, but it's simply trolling to equate that with personal animus towards individuals or a people as a whole. There are hot heads on both sides, it does you little credit to pander to the extremists who undoubtedly exist on your side, just as the do on ours. throwing cheap shots like "cult" around simply show your lack of awareness of the depths to which unionism in Scotland has sunk. Are you honestly trying to tell us that more than 50% of Scots who support the SNP in government in Scotland are cultists? You're not a rationalist with unique or privileged access to all that is right Jim; you're just some guy on the internet who enjoys "othering" political opponents and finds it easier sitting on the sidelines throwing ill considered insults from the sidelines rather than engaging in reasoned debate. You ARE a nationalist, it's just that you don't want to own up to being a British nationalist and somehow regard that as qualitatively different to being a Scottish nationalist. It's as ridiculous a stance as all of those who entered the First World War insisting that God was on their side. What plan does the SG have exactly? Other than to try and use every opportunity to try to force further cracks into the Union? Do we know what would qualify as a 'soft Brexit' or a 'hard Brexit' as far as the FM is concerned? Do we know what 'in the short term' means as far as taking Indyref2 'off the table' is concerned? There is no plan from Holyrood I would suggest, just platitudes and vague threats designed to try to hold the faithful together just a bit longer as she edges towrad her new house and the nice big pension fund her and Mr Murrell have accmulated whilst achieving absolutely nothing for the people of Scotland. Eloquently put but ultimately wasted on the fundamentalist parts of the independence movement. Like you I think if we continue to try and placate/appease the SNP we'll end up in some pseudo independence state with the nationalist continually bleating as they do now. Likewise if we suspended reality and the UK government gave them what they wanted re Brexit does anyone honestly believe they wouldn't ferment division yet further or indeed still harbour independence? If the British parties had actually entered the Vow nonsense witha modicum of honesty and been open to Scotland being financially independent then it would wound the SNP. You only have to see how effective even the offer of it was at last referendum. Problem is the failure to deliver has spiked your biggest gun, now everyone just thinks London and Labour especially are lying everytime they speak. The further to the right England lurches the more likely independence comes, its not the EU rift that will break the union(although it doesn't help). Its the Tories and their UKIP driven agenda. Now isn't that ironic.